Physiotherapist is a medical professional that helps in coping up with physical pain with the help of some therapies, exercises, and machines. A physiotherapist used manual therapy, some mechanical instruments or electronic instrument to administer the treatment for the patients to relieve pain and improve the condition of the patient. Along with pain management, physiotherapy also helps in faster healing of joints, muscles and ligaments. The equipments are used for making the visit to the physiotherapist a comfortable one. The chairs, couch and bed used in physiotherapy clinics are some of the commonly used equipments in physiotherapy clinics, here are also some cushioned flat beds with head support that have several sections ranging from three to seven in numbers. These sections are meant to provide ideal condition to the patient to lie on his back or stomach as these sections are easily adjustable. The flat bed can also be folded easily to form a chair or an exercise bench. This equipment is a critical one when the therapist is examining or diagnosing the patient. Same equipment is also used for conducting exercising during the treatment of the patient. The weights are used for performing some weight exercises. Along with weights, some elastic and exercise bands are also a part of exercise during the treatment. Some large air filled balls are also used for support from back during the exercise. This prevents the patients from hurting their back during exercise. There are also electronic equipments that can be found in a physiotherapy clinic that are used alone or in combination to provide relief from pain to the patients. The TENS is an instrument that is used for providing short term relief from the pain, which helps the patient in avoiding the narcotic or painkillers that have severe side effects. The short term relief is provided with the help of short electronic waves. Another similar instrument is interferential unit, which works in the same way but at a deeper level. Physiotherapists buy CPM machines to provide continuous passive motion to the joints of the patients to regain its motion. The CPM helps in giving an extended range of motion to an injured joint of the patient and that also without any effort from the patient. 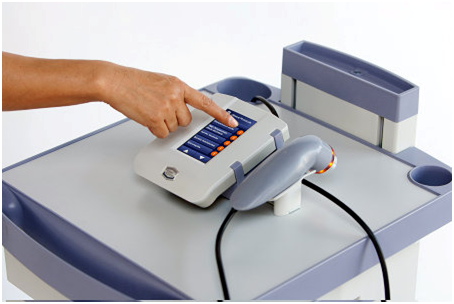 CPM machine is normally used after a joint replacement surgery to avoid the after effects of prolonged immobilization. Heat therapy is the oldest way of relieving pain and stiffness. The short wave heat therapy and ultra sound therapy are two major heat therapies that are used in physiotherapy clinic. The ultrasound therapy works on a deeper level where conventional heating methods do not work. The instrument uses an ultrasound probe which sends ultrasonic waves to the tendons and ligaments deep under the skin, which eventually relieves the pain and accelerated the healing process. With the right use of these equipments and modalities, a professional physiotherapist can do wonders with your pain conditions and that also without any threat of side effects.